Turkey's Constitutional Court is meeting to consider if the governing AK Party should be banned for alleged anti-secular activities. It is the culmination of a series of clashes between the party, which has Islamist roots, and the secular elite. The AKP, which won a huge poll victory last year, denies it wants to create an Islamist state by stealth and calls the case an attack on democracy. 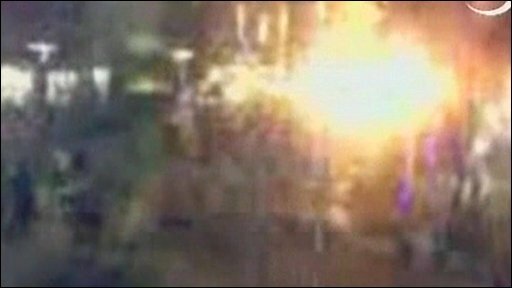 Hours before the court opened, bomb attacks in Istanbul killed 17 people. Five of those killed were children, the governor of Istanbul said, while more than 150 people were wounded in the twin bombings, six of whom remained in hospital with serious injuries. 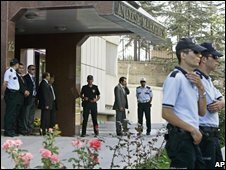 It was not immediately clear who was behind the attacks - security services said they had similarities with previous attacks by the Kurdish separatist PKK, although the group itself denied any involvement. The country has also been attacked in the past by other leftist radical groups and Islamists. Prime Minister Recep Tayyip Erdogan said the bombings only strengthened Turkey's determination in its fight against terrorism. It was not clear if the attacks were timed to coincide with the controversial court case, which represents a clash between powerful forces. But Mr Erdogan insisted his thoughts were with those affected by the bombings. He cancelled a Monday morning cabinet meeting to travel to Istanbul and visit the site of the attacks. At the scene, Mr Erdogan downplayed the courtroom drama unfolding in Ankara, Turkey's capital. "Our problem is not whether or not AK Party will be closed," Reuters news agency reported him as saying. "Our problem at the moment is to keep our unity so our country will go in a different direction." 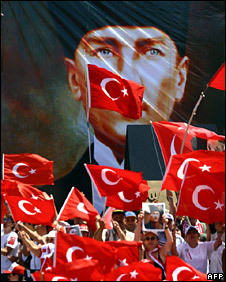 The modern Turkish republic was founded in 1923 as a secular and unitary state. Since the 1960s, more than 20 parties - mostly pro-Islamist or pro-Kurdish - have been shut down by the courts for allegedly posing a threat to those principles. However, this is the first time that a closure case has been brought against a governing party with a huge parliamentary majority, the BBC's Pam O'Toole says. The stakes are high, she adds, with the AKP fighting for its political survival and the secularists viewing the case as their last opportunity to block what they allege are attempts to turn Turkey into an Islamic state. More than 70 AKP members, including President Abdullah Gul and Prime Minister Recep Tayyip Erdogan, could be banned from political activities for five years. The party argues that it is facing a "judicial coup". The Constitutional Court has said it will convene on a daily basis until the 11 judge-panel reaches one of three verdicts - to shut down the party and impose political bans on its members; to cut treasury aid to it; or to throw out the case. If the party is closed down or large numbers of its senior members are banned from politics, it will deepen the political fault lines between AKP supporters and secularists, our reporter says. This could lead to a period of political instability or even another general election, with the AKP's deputies regrouping under a different name, she adds. Last week, an adviser to the court recommended that it should not shut down the AKP, arguing its decision to lift a ban on Islamic headscarves in universities had not challenged the constitution. The case has already caused uncertainty in Turkey's stock market. There is also speculation that a ban could harm Ankara's long-running bid to join the European Union, which has expressed concern. During its first term in office, the AKP pushed through major reforms aimed at EU membership. But critics allege that, in its second term, it has focused more on policies aimed at its conservative supporters.